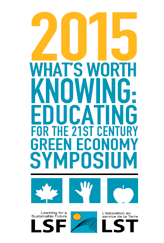 The symposium explores the opportunities and benefits of connecting the discourse on 21ST Century education, to learning for a green economy, thereby addressing the economic, environmental and social challenges that will define the prospects for human existence on this planet beyond the next century. You are also welcome to join us for our 13th Annual State of Education for Sustainable Development Gala Dinner on May 14th at the Arcadian Loft. For further information please contact Elaine at symposium@lsf-lst.ca or call 1 877 250 8202 or 416 327 2032.